located in Middleton, Beverly, IPSWICH, NEWBURYPORT and Marblehead. North Andover location COMING SOON! The mission of our business is to connect families to the possibility of achieving a healthy diet with our local products. 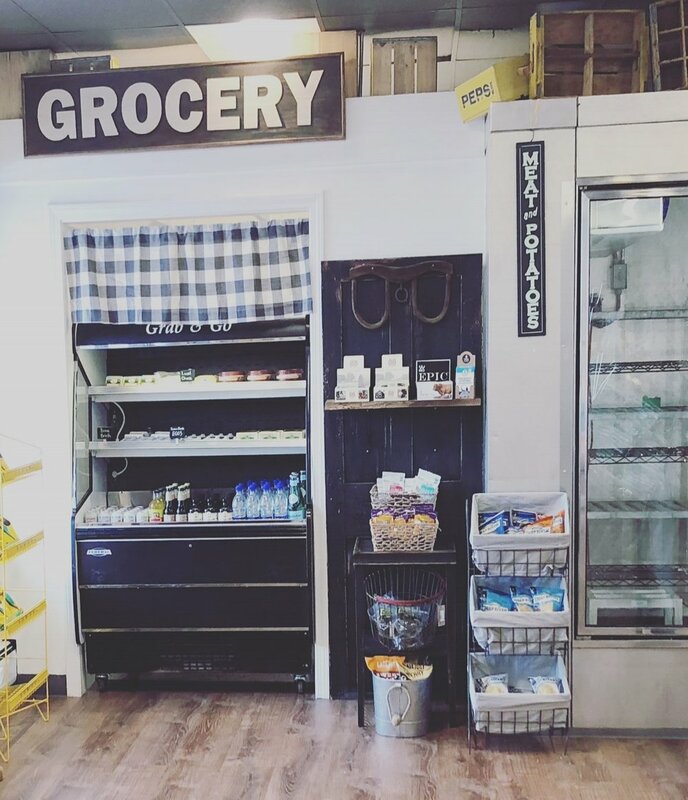 Our butcher shop has an old-fashioned feel that carries meats from animals raised on small, local, sustainable farms. 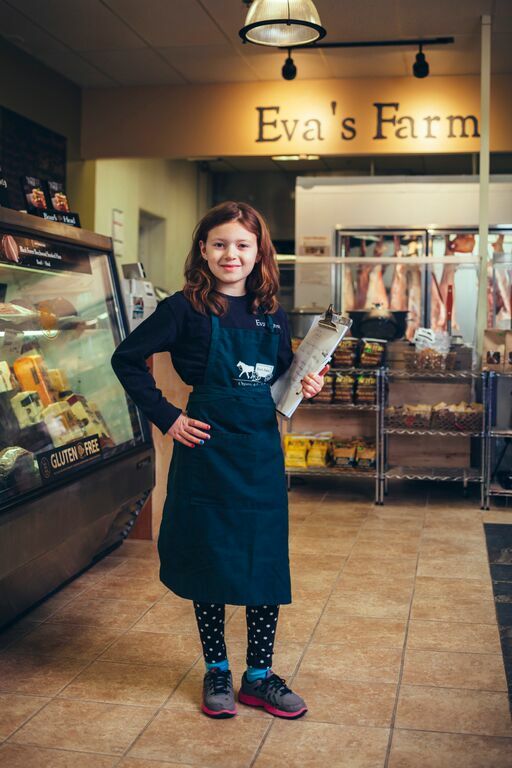 Eva's Farm is adding conventional beef to our menu choices. While we understand that this is not part of our original mission, we have thought long and hard about this but we feel that we need to appeal to more customers' taste buds. We also feel that this is a great opportunity to draw in customers and take the opportunity to educate them as to the benefits of the different tiers of meat we offer. 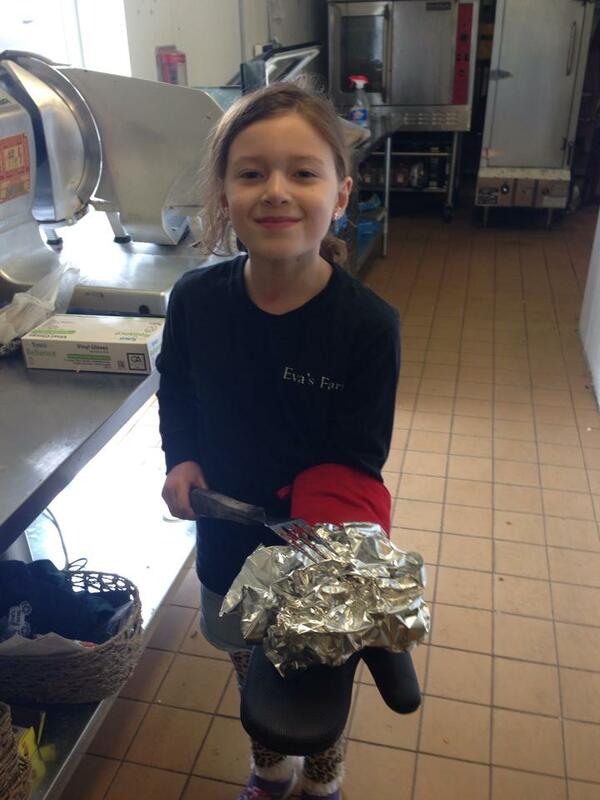 Eva's Farm will continue to offer our preferred two tiers of beef, organic and sustainable local beef. In our research, we have found that certified organic beef bought in the typical supermarket is $8.99/lb while we offer ours for $6.99/lb; a savings for our customers. Be sure to ask for it when you come! 1. Our meat is raised locally. We will offer only premium products from local farmers who have raised their animals on either a primarily grass-based diet or in an organic manner as well as other dairy products and locally-grown vegetables. 2. Our animals are treated humanely. These animals live natural stress-free lives, never treated with antibiotics, hormones, or fed animal-by-products and therefore produce healthy, great-tasting meat, milk and eggs. Their diets are GMO-free, and the grasses are never sprayed with pesticides. Our pastured beef is abundantly marbled ensuring a tender texture and a deep, rich flavor. By working in partnership with local farmers we guarantee our rigorous standards are always carefully maintained. 3. Our meat offers health benefits. Pastured meat is; lower in total fat with more “good” fats and fewer “bad” fat, higher in beta-carotene, higher in vitamin E (alpha-tocopherol), in the B-vitamins thiamin and riboflavin, also higher in the minerals calcium, magnesium and potassium, higher in total omega-3s, has a healthier ratio of omega-6 to omega-3 fatty acids (1.65 vs. 4.84), higher in CLA (cis-9 trans-11), a potential cancer fighter, higher in vaccenic acid (which can be transformed into CLA), and lower in the saturated fats linked with heart disease, free of hormones, antibiotics or other drugs. 4. Our business is good for the environment. Our commitment supports local farmers and minimizes environmental impact. Industrial farming requires transportation, processing, packaging and fossil fuel usage that puts tremendous stress on the environment. For example, between production and transportation, growing 10% more produce for local consumption in Iowa would result in an annual savings ranging from 280,000 to 346,000 gallons of fuel, and an annual reduction in CO2 emissions ranging from 6.7 to 7.9 million pounds. 5. Our product is affordable. In general, pastured meats cost 15% more than factory farm meats available at a supermarket chain store but it’s worth it. Here’s why: Additional land is required to cultivate grass-fed beef. The quality and maintenance of that land has to be very high. Grass-fed cattle require an average of 7 months more in order to grow large enough to go to market while grain-fed cattle fatten up quickly. More staff is required to give cattle the optimal care, provide a low stress environment and excellent nutrition throughout their life. Our butchering process uses dry aging techniques to improve flavor which also takes time. Economics favor a large corporate farm over an individual grass-based farm but your health is worth the small increase in price. Our passion behind this business comes from our personal experiences with food and health. I am a Type 1 diabetic and allergic to gluten. In researching what celiac (allergy to gluten) was and how it gets into food, my wife and I were amazed at the way our food is processed. We decided to transform the way we eat, not only for ourselves but for our daughter. My wife and I then took a look at the meats we were eating and used the information below, which compares grass-fed to grain-fed; to further help us make the decision to eat sustainable and organic food. We have made a table to help compare the information as well. My experience, skills, and strengths I personally bring to this new venture stretch over decades. I was born and raised in Argentina by a family of commercial meat butchers where I learned most of my skills that I now use in my current profession. Growing up, my family raised chickens, pigs and cattle for the butcher shop that my father owned; my father also owned the slaughterhouse. When I became old enough, I opened and ran my own successful butcher shop in Argentina for 10 years which I left to my mother to come here, to the USA. Being involved with this process all throughout my childhood and early adult life has led me to aspire to opening the same type of business here in Massachusetts. These past experiences have helped me understand the hard work and dedication needed to be successful in this industry. The biggest driving factor behind my business is that I also want my daughter to grow up with a more organic lifestyle and learn what it means to eat healthy. She understands the importance of knowing where food comes from, and how animals have been treated. Our butcher shop will work as shops did 50 years ago, just like when I helped my parents in their business. It all starts by team members contacting, visiting, selecting, pricing and buying all kinds of livestock and products of farmers (cows, pigs, chickens, turkeys, calves, etc.) as well as cheese, vegetables, milk, and anything we will need for our business. Our new location hours are Monday-Saturday, 9am-7pm and Sunday 9am-6pmlocated at 155 High St. in Ipswich! - Demos and samples on Saturday from Del Sur Empanadas 10-12pm and Big Rich's BBQ, 12-2pm. Samples will also be offered from The Lemon Tree in Ipswich! homemade items that we are offering! Come in and try them today! COMMUNITY SUPPORTED AGRICULTURE (CSA) has become a popular way for consumers to buy local, seasonal food directly from a farmer. Our CSA program is available in all of our 5 locations. The program is a month by month program so please note that you have to sign up for each month separately. You can either stop in or call to place payment of $200 by the 1st week of each month. You will get 20% on the following items and can pick up items throughout the month as long as all $200 worth of discounted items are picked up by the end of the month, no exceptions! call with any questions. We are very involved in our community. Below are images taken during our many events that we hold here at Eva's Farm each month. Check our Events Page to see what events are coming up this month! or or email us with any questions at info@evasfarm.com. Sign up for our Mailing List to receive information on events and Specials! We are always looking to support local farmers. Fill out the form below if you are interested in becoming one of our suppliers!